Recently some researchers conducted an analysis of some postmortem brains from people with Parkinson’s and they discovered something rather curious. Half of the brains that they analysed came from people with Parkinson’s who had been given deep brain stimulation (or DBS) to help manage their symptoms. When the researchers analysed the mitochondria – the powerstations of each cell – in the dopamine neurons of these brain, they found that the DBS treatment had helped to improve the number of mitochondria in these cells. Specifically, the DBS treatment “seemed to have inhibited or reversed the reduction in mitochondrial volume and numbers” that was observed in the Parkinson’s brains that had not had DBS. In today’s post, we will look at what DBS is, what the new research report found, and what these new findings could mean for the Parkinson’s community. Do you know the worst thing that happens to us in life? We wake up each day. Every day of our lives (so far) we have woken up and been given – without any kind of justification – another 16 or so hours to do whatever we want with. Regardless of one’s physical/mental state, this is a bad thing. This continuous pattern is what is referred to in psychology as a ‘continuous schedule of reinforcement’. Such regimes instill complacency and – worse – expectation. They quickly lead to people taking things for granted. 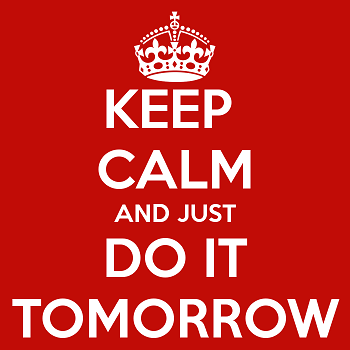 All of us are guilty of thinking “I’ll do it tomorrow”. Such a continuous pattern of reinforcement does not prepare one well for a life in scientific research, where there isn’t a constant schedule of reinforcement (quite the opposite actually). Experiments regularly go wrong (reagents/equipment fail), grants/manuscripts get rejected – it can be rather brutal. But here is where the addictive component of science comes into effect. Every so often, something works. And even better, every so often something unexpected happens – an ‘intermittent/irregular schedule of reinforcement’. An experiment will occasionally spit out a completely unexpected result, which could change everything. These are the moments of insights that researchers are slaving for. The instant that they are the first to “walk on the moon”. They are moments to savour. And this must have been the state of mind for some researchers who dicovered something surprising and absolutely remarkable recently while they were looking at some postmortem brains from individuals with Parkinson’s who had been treated with deep brain stimulation. Deep brain stimulation (or DBS) is a treatment method that involves embedding electrodes into the brain to help modulate the brain activity involved in movement. First introduced in 1987, deep brain stimulation consists of three components: the pulse generator, an extension wire, and the leads (which the electrodes are attached to). All of these components are implanted inside the body. The system is turned on, programmed and turned off remotely. The electrodes that are implanted deep in the brain are tiny, and the very tip of them has small metal plates (each less than a mm in width) which provide the pulses that will help mediate the activity in the brain. The electrode extends up into the leads (or extension wire) which continue up and out of the brain, across the top of the skull, down the neck and to the pulse generator which is generally located on the chest. There are many different brands/types of pulse generators, but they all largely do the same basic function. They are titanium packets containing the electronics and power supply for the leads and electrodes. They are implanted in a subcutaneous spot, usually located under the collar bone on the chest. The pulse generator is programmable (which the doctor usually does several weeks post surgery). A small hand held device is used to turn on/off the generator, generally by holding the device over it. For more information on the topic, click here to read about a case report of deep brain stimulation implantation. How does deep brain stimulation actually work? I have previously discussed how we initiate movement (Click here to read that post), and I will only briefly summarise the basics here. Movement is largely controlled by the activity in a specific group of brain regions, collectively known as the ‘Basal ganglia‘. The basal ganglia structures (blue) in the human brain. The basal ganglia receives signals from the overlying cerebral cortex regarding possible movements to make, and it processes that information before sending a signal on to another important participant in the regulation of movement: the thalamus. The thalamus is a structure deep inside the brain that acts like the central control unit of the brain. Everything coming into the brain from the spinal cord, passes through the thalamus. And everything leaving the brain, passes through the thalamus. It is aware of most everything that is going on and it plays an important role in the regulation of movement. Importantly it is biased towards inhibiting movement – a signal from the basal ganglia has to be pretty strong, for the thalamus to give the green light and a particular movement can then be made. Under normal circumstances, dopamine producing neurons release dopamine in the basal ganglia where it helps to mediate the local environment. It acts as a kind of lubricant for movement, the oil in the machine if you like. It helps to reduce the inhibitory bias of the basal ganglia. Thus, with the loss of dopamine neurons in Parkinson’s, there is an increased amount of inhibitory activity. And as a result, the thalamus is kept in an overly inhibited state. And this is the reason why people with Parkinson’s have trouble initiating movement. Now, as you can see from the image above, the globus pallidus is one of the main conduits of information into the thalamus. Given this pivotal position in the regulation of movement, the globus pallidus has been a region of major research focus for a long time. It is also one of the sites targeted in deep brain stimulation therapy for Parkinson’s. Another target of deep brain stimulation therapy is the subthalamic nucleus which help to regulate the activity of the globus pallidus. By placing electrodes in one of these two brain regions (see image below), doctors can regulate the signal being passed from the basal ganglia to the thalamus and thus provide people with Parkinson’s relief from their motor-associated symptoms. But what do the electrodes do? To keep things simple, in today’s post we are going to focus on the subthalamic nucleus. The subthalamic nucleus is a very small region of the brain (140 cubic mm), consisting of approximately 300,000 neurons – making up about 0.02% of the total volume of the brain. In Parkinson’s, the subthalamic nucleus becomes very excited, and the cells in the region start firing at an increased rate. This over activation of the region results in dysfunction in other parts of the basal ganglia – ultimately disrupting normal movement. The electrodes that are placed in the subthalamic nucleus during deep brain stimulation will be programmed to release tiny electrical pulses that will help regulate the firing of the surrounding cells. By modulating the firing of those cells, deep brain stimulation reduces the inhibition in the basal ganglia circuit overall, which allows individuals with Parkinson’s to move more freely. Can DBS slow down the progression of Parkinson’s? This is an interesting question that has been gaining some attention recently. Let me be clear, there is no current clinically available treatment that can slow the progression of the condition. But recently there has been some dsicussion that DBS could potentially be having a subtle neuroprotective effect. The idea is based on the premise the DBS may reduce glutamate excitotoxicity in the substantia nigra. Que?!? What does any of that even mean? Glutamate is a neurotransmitter (or messenger protein) in the brain – similar to dopamine. It is involved in passing on excitatory signals. But too much excitatory signal can become a bad thing, and high levels of glutamate can be toxic for neurons. How does Glutamate do this? When glutamate is released from one neuron it stimulates receptors on another cell, which causes an influx of calcium and sodium into that cell. This excites that cell, increasing the chance of a signal being passed on. Hence the reason, glutamate is considered ‘excitatory’. Too much glutamate stimulation, however, can result in too much calcium entering the neuron. This outcome not only over excites the neuron, but puts a great deal of pressure on the internal works of the cell (resulting in increased levels of reactive oxygen species & mitochondrial dysfunction). Too much glutamate excitatory signal can beome toxic for neurons. Ok, but what is the substantia nigra? And why would this glutamate excitotoxicity be occuring there? 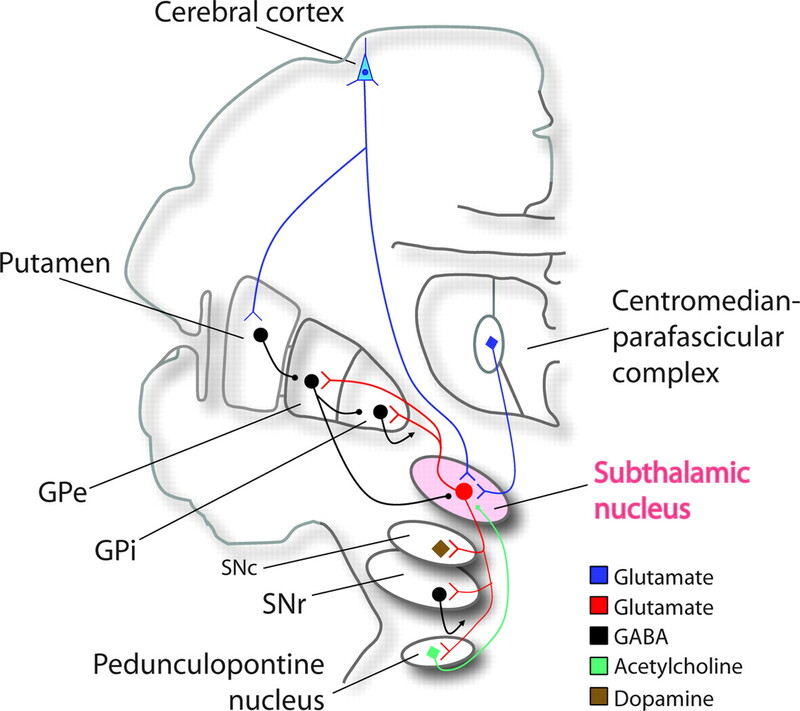 There is a connection between the subthalamic nucleus and the substantia nigra – this is the region of the brain where the dopamine neurons reside. The subthalamic nucleus projects branches down to the substantia nigra (SNr and SNc in the image below, respectively). And these branches release glutamate in the substantia nigra region. The theory of DBS neuroprotection suggests that as Parkinson’s develops and the subthalamic nucleus becomes increasingly over active, it starts releasing too much glutamate in the substantia nigra. This ‘excitotoxicity’ situation is unlikely to act as a major causal agent in the development of Parkinson’s, but it could leave the dopamine neurons even more vulnerable to the condition. Thus, by carefully regulating the activity of the subthalamic nucleus using DBS, there is the possiblity that dopamine neurons will be less exposed to toxic levels of glutamate and be given a slight reprieve. Authors: Helton TD, Otsuka T, Lee MC, Mu Y, Ehlers MD. Journal: Proc Natl Acad Sci U S A. 2008 Dec 9;105(49):19492-7. In this study, the researchers reported that high levels of PARKIN protein reduced excitatory transmission between neurons. Conversely, removing PARKIN protein from neurons or introducing high levels of the Pasrkinson’s-associated mutant version of the PARKIN protein significantly enhanced synaptic efficacy, and it also triggered an increase in glutamatergic synapses specifically. But this increase in glutamatergic synapses was associated with increased vulnerability due to excitotoxicity. Has anyone ever tested this idea of glutamate excitotoxicity and DBS being neuroprotective? Journal: Parkinsonism Relat Disord. 2014 Jul;20(7):731-7. All of the participants had been taking medication for more than 6 months, but less than 4 years, and none of them had any motor fluctuations or dyskinesias. The goal of this small pilot study was to assess the safety and tolerability of DBS in early stage Parkinson’s. The investigators found that at 24 months after starting the study, there was no significant difference in clinical motor assessment scores (UPDRS III) ON or OFF medication, but the DBS+optimal drug therapy group was taking less medication at all time points during the study. The researchers concluded that “DBS is well tolerated in early PD. The results of this trial provide the data necessary to design a large, phase III, double-blind, multicenter trial investigating the safety and efficacy of DBS in early PD”. Ok, but what does the new research suggest? Something really interesting… and wholly unexpected! Authors: Mallach A, Weinert M, Arthur J, Gveric D, Tierney TS, Alavian KN. In this study, the researchers were interested in assessing mitochondria in the brains of people with Parkinson’s. Mitochondria are the power house of each cell. They provide the cell with energy, which helps to keep the lights on. Without them, the lights go out and the cell dies. An interesting detail to note regarding Parkinson’s and mitochondria is that many of the early onset forms of Parkinson’s are associated with genetic variations in genes that are involved with normal mitochondrial functioning (such as PINK1 & PARKIN – Click here and here to read previous SoPD posts about this). Ok, and what did they find? The researchers collected postmortem samples of brain tissue from seven people with Parkinson’s and three unaffected control subjects, and they conducted an analysis of the mitochondria in dopamine neurons (these are one of the populations of cells that are badly affected by Parkinson’s). Specifically, the investigators looked at mitochondria in presynaptic axon terminals of the dopamine neurons. And before you ask, the presynaptic axon terminals are the very tips of the branches of the neurons, where they make connections and communicate with other neurons (see image below). 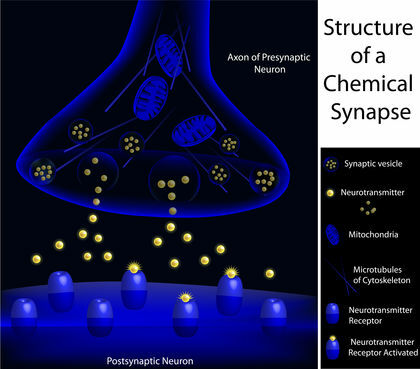 The presynaptic region is a very active region of a neuron, and thus requires a great deal of energy – which is provided by mitochondria in the area. The analysis was conducted on a region of the brain called the caudate and the putamen. These are the primary sites in the brain where dopamine neurons neurons extend their branches and release the bulk of their dopamine. The researchers found that there was a significant reduction in the number of mitochondria and size of the mitochondria dopamine neuron branches in the brains from people with passed away with Parkinson’s (without DBS). But when they turned their attention to the Parkinson’s brains which had been treated with DBS in the subthalamic nucleus (a region distant to the putamen and caudate), they found that the dopamine branches in the putamen and caudate had mitochondria of similar number and size to that found in the unaffected, healthy control brains. mitochondrial volume and numbers caused by PD“. They also suggested that the “results suggest enhanced metabolic plasticity leading to neuroprotection in the SNpc as a result” of subthalamic DBS. It will be very interesting to see if the results can be replicated using other samples of brain tissue (only 3-4 brains in each group – PD, PD+DBS, control – were used in this study, which is a rather low number). If independently replicated though, such a result could re-ignite the debate over whether modulation of the subthalamic nucleus could be beneficial for folks with Parkinson’s. 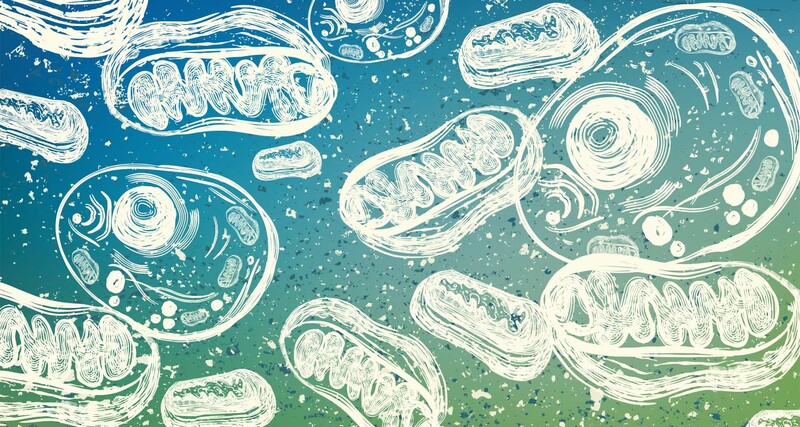 Mitochondria are an important source of energy in cells, and dysfunction in these entities are believed to play a role in the course of Parkinson’s. Researchers in London (UK) have recently reported that deep brain stimulation (DBS) of the subthalamic nucleus improved the number and size of mitochondria in the presynaptic terminals of dopamine neurons in the brains of people with Parkinson’s. Such a finding is likely to stimulate a great deal of discussion within the research community as to the potential effects of DBS, which already represents a useful treatment option for people suffering from the debilitating motor complications of Parkinson’s. Until the result is independently replicated (which should not be a challenging task), we will hold fire on getting too excited about this result. I might wait till tomorrow to have another think about this. The banner for today’s post was sourced from Bulletproof. April 4, 2019 - 12:22 am Lou T.
Yes, very interesting! So there was no reduction in progression in living patients (although less levodopa was required, which I guess would be expected due to levodopa therapy being mainly to ameliorate motor issues, which are the reason for DBS in the first place). And I would assume that the UPDRS motor function surveys were administered with DBS turned off, to avoid the acute effects of DBS…? But nonetheless, more mitochondria were present in synaptic terminals in autopsies of DBA patients. Paradoxical. So, does that mean that mitochondria are not as important as we had thought in protecting neurons against PD progression? Because here we have more mitochondria, but no improvement in progression. It seems to raise more questions than it answers, but yes, very intriguing. I can’t help being reminded of the recent findings with 40 Hz light and sound pulsations, as that’s another rhythmic stimulation of the brain that appears to affect amyloid plaques in Alzheimers mice, and is speculated to possibly affect PD alpha-synuclein deposits, as well. Like I said, more questions than answers; it’s just kind of overwhelming at the moment. Leaves me feeling hopeful, though, to have so many new phenomena to investigate. April 4, 2019 - 12:37 am Lou T.
Although, reading a little further, the posmortem study that is causing this excitement had a miniscule sample size of just 3 DBS-treated patients and four PD patients who had not received DBS. So what are the chances that these apparent paradoxes are due to tha small sample size?